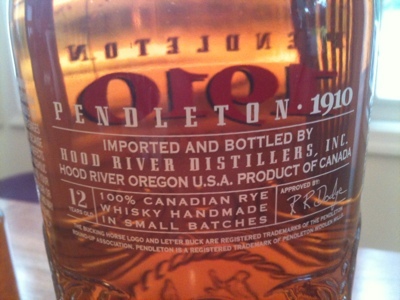 The Coopered Tot: Pendleton 1910 100% Canadian rye - an Oregon Canadian with rich flavor and astounding creaminess. Given that it's a 100% rye, the whiskey is probably being sourced from the same distillery that supplies Whistlepig, Jefferson's rye and Masterson's. Great tip on the Jefferson's - and great review, Jordan. 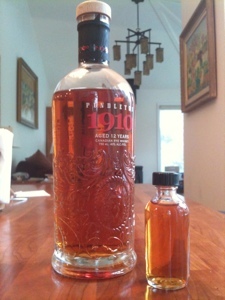 Pendleton's 1910 at $32-$35 is very well priced. I, too, wonder how it would play at 43-45% abv. I suspect that the heat and pow would compromise the smooth finish. 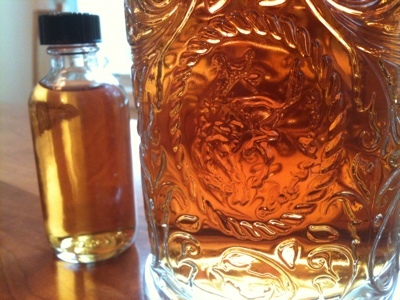 It might be worth it, however, for the richer flavors. I noticed you had a question above about where this is actually distilled and aged. It is in my hometown! The whisky is crafted from 100 % rye, distilled and oak-aged by Alberta Distillers Limited (ADL) in Calgary, Alberta Canada for 12 years. Thanks so much! 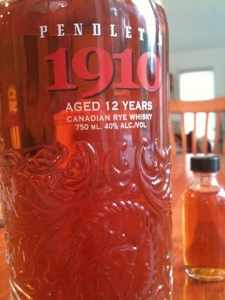 Hard to believe it's made at the same distillery as Alberta Premium, Whistlepig, and Masterson's. The flavor signature is very different. More soft creamy cherry malted rather than the more , clean pointedly sweet and herbal pow others. Davin De Kergommeaux said that they use a different production method for this stuff but wouldn't provide any additional details. Clearly additional research is necessary.